Premiere Institute Beware! I Have Arrived, This was the first thought in my mind when I set foot at the prestigious Premiere Institute of Technology. There was enough reason for me to think that way. I was an out and out rebel. I never followed rules. I never respected the system. I cheated, manipulated and was headed to no mans land. The institute was probably worried I would take a few more with me. And then, I met my friends and things started to change. I started believing in dreams and became who I am today. I guess I was destined to become John, Divya and Viveks Dada. May be, relationships do transform lives. In my case, they did. Ive had my share of ups and downs in life. I have experienced the joy of gaining new friends and the loss of people who held me close. Ive seen concrete foundations reduced to ruins and the joy in making dreams out of rubble. But through everything, Ive loved my life. I am Dada and this is my story. The first few pages of 'DADA' leave you in a daze. Not because the language used is less than brilliant or the protagonist Dada seems too full of himself, but because you cannot make out whether you should put the book away or continue reading. But after a while the book just grows on you. Mr. Tikhiya's simple writing style seems just right for the narrative and Dada becomes the kind of person every young college student would either kill to be or want as a friend. Once other characters come into the picture you find yourself relating to them almost immediately, drawing parallels with your own college life and thinking about which character fits which one of your friends. The plot though quite simple and linear is eventful enough to make you want to know what happens next. All in all 'Dada' is a good read. The book makes you think of the friends you have or have had and lost. It even makes you want to shed a tear a couple of times or just laugh out loud. I believe Mr. Tikiya has a great future ahead of him as a storyteller and wish him all the best. 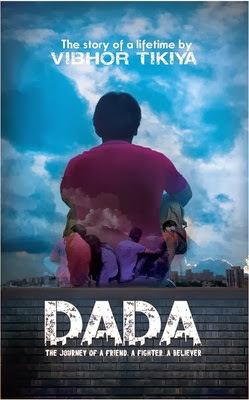 You can buy 'Dada' at a discount price on Flipkart and Infibeam. can't believe you haven't watched the elf yet, omg, it's hilarious!